We have no Bed and Breakfast accommodation available for the spring and summer season 2018. However we have plenty of self catering options. Please have a look at our self catering pages. Each of the bedrooms is unique and all the rooms have flat screen televisions, ipod docks, hairdryers and tea and coffee making facilities. Our bedrooms are all en-suite - complementary toiletries and fluffy towels await you. We invite our guests to relax in and enjoy the Great Hall with its cosy fireside sofas and magnificent gothic windows with views of the garden, or snuggle up in our Welcome Hall with a book or game from our well stocked shelves, or plan a day out from the comfort of a fire side seat. Rates are per room per night and based on two people sharing. Prices include full cooked and continental breakfast. Our largest bedroom occupies the whole of the top floor of the original 500 year old tower house. It boasts a four poster bed and spacious en-suite with freestanding bath, twin sinks and large walk-in shower. It is accessed via the original stone spiral stair case. In the corner of the bedroom is a small circular turret, with window over looking the castle courtyard. The window, it is said, through which Roy Roy MacGregor escaped in the night when hearing soldiers approach, and in his haste leaving on his bed his sporran and dirk, which became a treasured relic handed from generation to generation of the Graham family. This beautiful, calming double bedroom occupies the east end of one of the Victorian additions to the castle. It enjoys views in three directions, including spectacular views north to the river and forested mountains beyond. 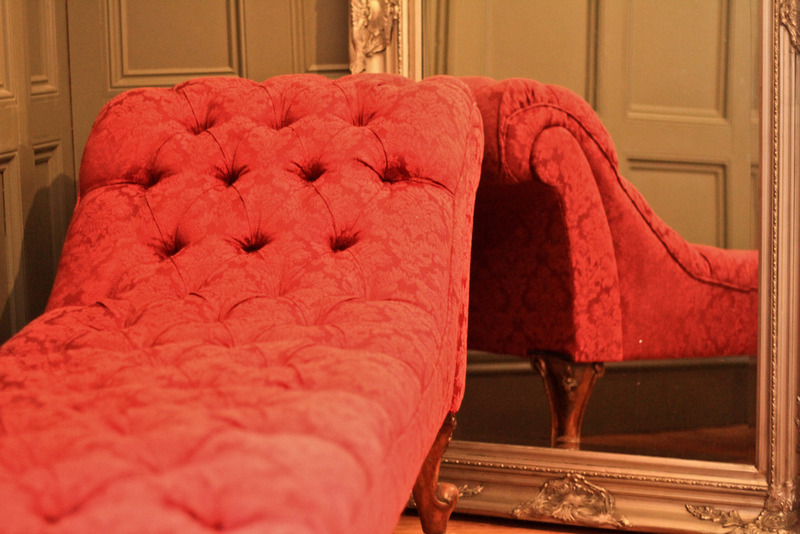 There is a five foot sleigh bed and chaise longue in the bedroom, the bathroom has a large D-shaped bath with shower. £175 per night including breakfast for 2 people. This delightful, warm and cosy twin room is in one of the Victorian additions to the castle, it enjoys spectacular views north to the river and mountains beyond. There are two 3 foot single antique beds in this room. The bathroom has a spacious bath with shower above. £150 per night including breakfast for 2 people. This charming bedroom is accessed via it's own stone spiral stair tower. It is situated in the roof space of one of the Victorian additions to the castle and from the top of the house enjoys the best views of all, looking north east over the river and distant mountains beyond the village of Aberfoyle. There is a five foot double bed and the en-suite has a large luxury shower. Please note if you are much taller than 6 foot you might not enjoy this bedroom as the ceiling is sloped. Children are welcome at Duchray Castle, those too young to use the twin bedroom may stay in your bedroom in a cot or camp bed which we can provide for £10 per child per night including breakfast. For older children the twin room is located adjacent to the double bedroom. 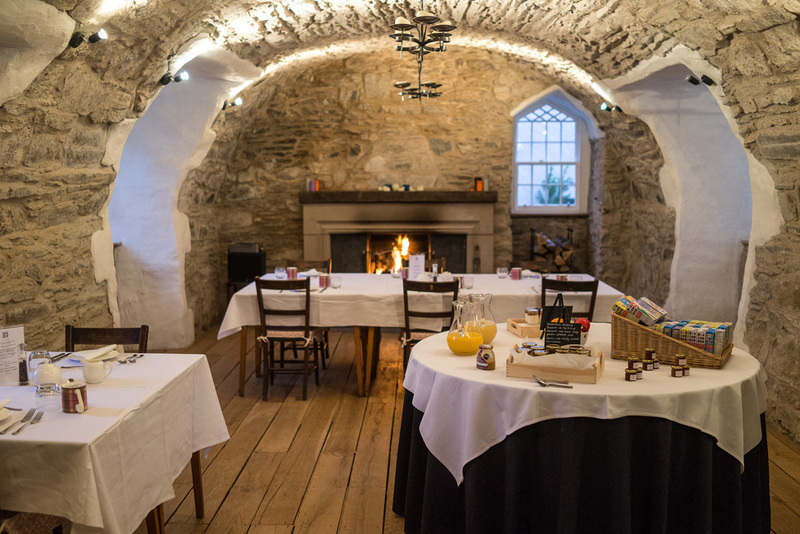 Breakfast is served in our vaulted dining room at a pre arranged time to suit you between 8am and 10am. We offer a continental and full cooked breakfast, using the finest local produce where possible. Cereals, pastries, fruit, yogurt and juices are available on a buffet with cooked breakfast being made to order. Special Dietary requirements will always be accommodated, please just let us know. Please note that Duchray Castle does not have an Alcohol License, however you are very welcome to bring any alcoholic drinks with you, we are happy to provide you with glasses and chill your drinks if required. There is a well stocked grocery store selling beers, wines and spirits in Aberfoyle.